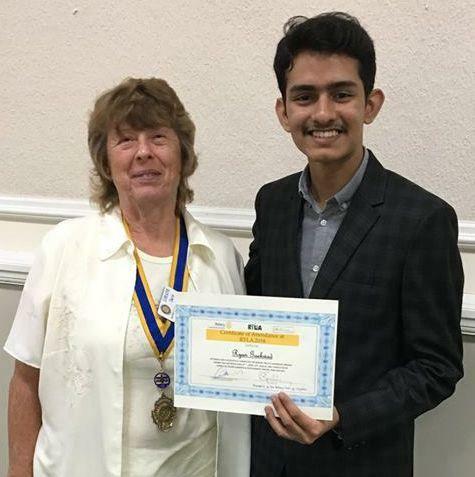 On 10 July 2018 Ryan Gaekwad, a sixth form student from Thomas More School, spoke about his experience of the Rotary Young Leader Award (RYLA) held at Easter 2018 at High Ashurst in Surrey. Croydon Rotary Club had sponsored Ryan and he spoke with great enthusiasm of his experiences and the confidence he had gained from attending, along with many other young people from Rotary District 1145. RYLA is one of the Youth programmes run by Rotary each year and provides a great opportunity for participants. At the end of the talk President Loraine presented Ryan with a certificate to add to his record of achievements. Each year, Croydon Rotary Club supports financially two local students from one school to attend the Rotary Youth Leadership Award scheme. The students are selected by the school, with the advice of the Rotary Club, and join some 50 or more students from a variety of schools in the District. They spend a week at the High Ashurst Outdoor Activity Centre on Box Hill near Dorking where they take part in a variety of team building and sports activities designed to develop personal self- confidence and self-esteem, and improve leadership skills by working with other young people of the same age and interests.